Uni-Tec® Model 100-S pig passage switch assembly features the use of a hermetically sealed proximity switch. 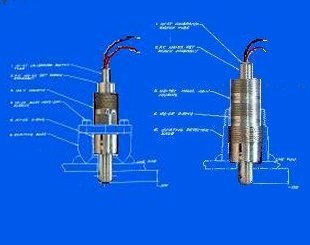 Permanent magnetic field and hemi-spherically shaped pressure balanced probe for bi-directional operation. It may also be adjusted or serviced under pressure conditions. Utilizing stainless steel components and assembled by means of welding, the detector having only one moving part (the probe) insures that once installed and properly adjusted, the detector is virtually service free. The detector is actuated when a pigging cup, polyurethane foam pig or sphere in passing causes the probe that extends into the ID of the pipe to be displaced. This displacement of the probe raises a balanced magnetic field into the vicinity of the proximity switch. The switch, housed in the calibrated tube, upon being influenced by the magnets closes completing the electrical circuit. Units are provided with standard welded base properly scarfed to specified pipe diameter. Flanged and Weld-O-Hub mountings are also available. Extension shafts are available for underground installations or insulated pipes (Model 100-SE). Extended trigger mechanisms are available for oversized sections of pig launchers and receivers (Model 500-S). In the event you already have detectors on line, we have replacement units available utilizing the existing base welded on the line. Replacement detectors allow you to use KIDD Passage Detectors even if your original unit was made by another manufacturer. Our assemblies are machined to high tolerance to allow mounting on existing bases without cutting or welding a new base. 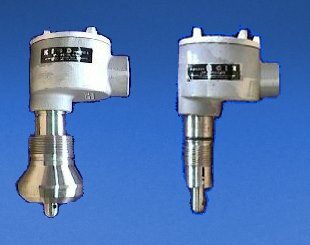 The entire detector assembly is housed within stainless steal and is pressure balanced without the use of any dynamic seals. When ordering replacement detectors - Please specify the existing Manufacturer, Model Number and line size so we can find a match from our inventory.